The Easter Bunny can’t be trusted. My sister and I still celbrate easter, even though we’re, “too old for it”. There’s no time when you can no longer have fun. I hide the eggs now. I’m an evil minion. Regrets? what’s all this?!? 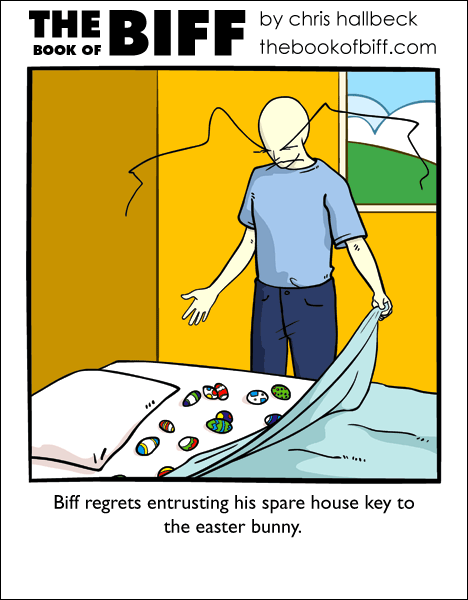 I wouldn’t regret finding the many easter eggs in my bed… unless they’re not chocolate, and really just painted eggs. Chocolate makes me feel sick because of my stomach, so my easter chocolate always lasts a month or two. The Easter Bunny is really a genetic aberration, I mean what kind of rabbit lays eggs and is pink? Too much radiation I suppose. I see a restraining order in the Easter Bunny’s future. @Chris: I think Rudo means that this is childhood myths week, and having the Easter Bunny implies that he is only a myth. @Chris: Good point. So childhood beliefs? I’d watch out for rabbit pellets! I called the EasterBunny before anyone else! The easter bunny hates your, Chris. @anon. : Let kids have their fun. Whether or not something started out as a pagan holiday has nothing to do with what it means now. The “easter bunny” is an modern (1600s) addition. I couldn’t find any info on when eggs began to be used as Easter symbols. Not gonna lie, that dream sounds massively terrifying. Thanks, MadDavid, for clearing that up! It saved me the trouble, haha. One time Easter was on my birthday, that was pretty awesome! As a kid, it made my birthday and Easter that much cooler. I can’t make a point today! i always thought the easter bunny was a guy. @no name: Which makes sense. It’s the female birds that lay eggs. Do you see where I’m going with this? Okay, got it. If you give your house keys to a magical creature, it will use your bed as an interspecies love nest. It’s taken me about four days, but I’ve finally read every single Biff comic. Clearly, my sick mind is contagious! I wouldn’t regret that. Free chocolate eggs!